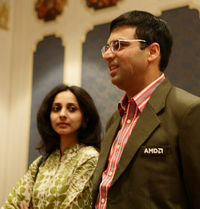 In October Vishy Anand successfully defended his title of World Champion. This was followed by a prolonged break from tournaments. In an interview with Harry Schaack the World Champion reviews the events of the last half year – and looks ahead to the GRENKELEASING Rapid World Chess Championship. At the beginning of August he will defend his title of World Rapid Champion – in Mainz and for the eleventh time. …where I had been invited to take part in the annual conference of the World Economic Forum. It was a new experience for me. A lot of scientists, influential politicians and businessman met in Davos. I had a lot of interesting discussions. In Bonn you surprised your challenger Kramnik with 1.d4 after having almost exclusively played 1.e4 before. In Linares you tried your new opening repertoire for the first after the World Championship match in a regular tournament. Were you happy with the results? Yes, I could use a couple of things I had prepared for the match in Bonn. For me it was important not to lose the feeling for 1.d4-openings because I have worked very hard to get it. The mistakes I made in Linares did not happen in the opening. That’s difficult to say. The first part of the tournament went better for me than the second. I did not necessarily play better with more practice. At the end of the tournament I made eight draws in a row. That is not really satisfying. It simply was no particularly good tournament – but neither the worst. This happens. 50% in Linares is no disaster. Yes, at one time I had a forced win in a bit more than 40 moves, another time in more than 60 moves … (laughs) It is incredibly difficult to play this endgame in a blindfold game. At a certain point I was a bit confused and did no longer exactly know where my knights were. A couple of years ago – also at the Amber tournament – Topalov won the same endgame against Karpov, but in a rapid game and with a better version of this endgame. I’ve now been playing for a couple of years for Baden-Baden. Unfortunately, I did not have much time in the last two seasons. In the previous years I sometimes played no less than seven games in one season. I like my team colleagues, the team spirit is excellent. It is fun to play together with the guys. The qualification cycle for the World Championship came under threat in the last months because the Grand Prix Series was about to collapse. Now, a candidates tournament shall be played. What do you think about the change of rules that directly affect you? Let us talk a bit about the Chess Classic, which will take place from 27. July – 2. August in Mainz. You won the title no less than eleven times – an extraordinary success. In fact, you achieved everything in your sport. You have been in the top for more than 20 years, you won World Champion titles in three different formats, and you won all important tournaments once or several times. How do you motivate yourself? The most important is to enjoy playing chess. I don’t believe you can only motivate yourself with titles or tournaments. Of course, these are goals that are necessary and that give you a direction. But the motivation comes from the game. I am aware that my drive will diminish at a certain point of time. But at the moment I just need a little break when I had too much. I still find chess very interesting. Moreover, in 20 years you always meet new players who pose new challenges. Talents such as Radjabov, Carlsen or Karjakin take care that things don’t get boring. Could you characterize Aronian’s style of play? We played a couple of times in Dortmund, but no rapid games. He is a promising „youngster“. Being 23 years of age, he probably won’t like to hear that, but it’s arguably still the case. He works hard on his openings. For some time I thought he might have his breakthrough in 2004, when he had a number of good results. In 2005 he won Dortmund in sensational fashion. After that he had no really bad results but was not playing steadily enough. After some minor setbacks he made great progress in the last year. His rating went up and in the April list he has more than 2700 Elo. The fourth player in the GRENKELEASING Rapid World Championship is Ian Nepomniachtchi. In last year’s Chess Classic he won the Ordix Open. From the three players, this is the one, I know the least. I have not played against him yet. He tries to emulate Morozevich a bit. His play reveals that he admires his countryman very much. But it is very difficult to copy Moro’s style because it is so unique. It requires an enormous amount of positional understanding. If you continuously strive for unknown positions, in which you cannot rely on theory or your preparation, you much more have to rely on your own sense of direction. Which in itself indicates his outstanding talent – after all, he can play that way. At any rate, he has the most unusual style of this year’s participants in the Chess Classic.